Just want to let you know I’m working on my first book which is a collaboration with Anna Brones who invited me into the project about two years ago. 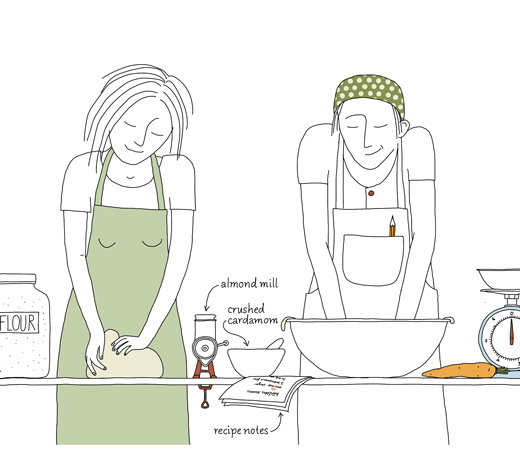 It will be an illustrated cookbook, with stories and recipes inspired by both our Swedish roots. The book is scheduled to be published by Ten Speed Press in the Autumn 2014. So lately both of us have been working extra hard in our separate kitchens (Anna in Paris & Portland and me in Brooklyn & at the countryside of South Sweden) developing recipes, licking pots, sniffing, making notes, sweating and burning our fingers. I’m of course super excited and it’s a great pleasure to be working on this specific book project together with Anna. I’m also busy with other great project. For example I just finished the drawings for the book The Culinary Cyclist and illustrations for the Public Art project, Overlay by Walczak & Heiss, which is in process to be installed at the new14th street corridor in Denver. There are many many other things on my table, but most of them are too early to announce. I will keep you posted. Make it a celebration every day! That’s a wonderful idea! I think Anna would like that too 🙂 Cheers! Congrats, Johanna! Can’t wait to see the book! Thanks Leela. At the moment I’m working on the drawing for the book :).